In the United States, the 4th of July holiday is all about family, friends, fireworks and food. Lot’s of food. Indeed, nothing says summer holidays like a good old-fashioned BBQ. Here are some tips for how to grill safely and eat healthy this summer. Watch where you grill: Remember never to grill indoors, in the garage or under anything that could catch fire. Always keep your grill away from siding, railings, trees and anything else flammable. The U.S. Consumer Product Safety Commission recommends keeping grills at least 10 feet away from any home or building . 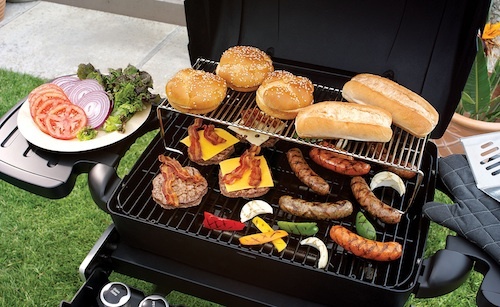 Control flare-ups: Keep a portion of your grill empty so you can move food if a flare-up occurs. When you have a flare-up, move the food away and let it burn with the lid up. The key is to let the fire burn off the grease and get rid of it as quickly as possible. Keep children away from the grilling area: Toddlers, preschoolers and even older kids who are busy playing can run into the grill without warning. Grill temperatures can exceed 350 degrees F, and can burn skin instantaneously. Grill lean meats: Lowering the fat content of meat can decrease your overall caloric intake. Load up on grilled veggies: Vegetables are a healthy choice and the fiber will help you feel full. Watch those portion sizes: With bigger food portions come more calories, and consuming extra calories can lead to obesity, diabetes, heart disease and some cancers. Use whole wheat buns: White bread is a high glycemic index food, and causes a spike in your insulin and makes your body store fat. Skip the white buns and try whole wheat instead. Don’t skip meals to save calories for later: This leads to overeating and causes you to make poor choices because of hunger and low blood sugar. Don’t leave food out all day: Allowing food to sit in outdoor temperatures can lead to foodborne illness. The U.S. FDA suggests never leaving food out for more than one hour when the temperature is above 90 degrees F and not more than two hours at other times . Everyone loves a good BBQ, but did you ever wonder just how popular BBQ grilling actually is? 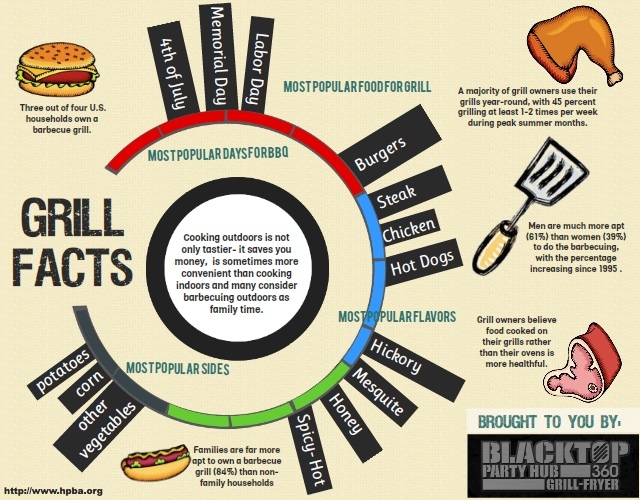 The Hearth, Patio and Barbecue Association (HPBA) came up with some fun facts and statistics about grilling that may surprise you or confirm what you’ve always suspected. Check out the infographic below. CPSC Releases Grill Safety Tips. U.S. Consumer Product Safety Commission. 1997 May 20. Consumers: Eating Outdoors, Handling Food Safely. U.S. Food and Drug Administration. Accessed 2013 July 1.